This year’s water activities programme is now ready to go, with RYA Sailing Courses and open boating for all Scouts & Explorers to join in with. All courses based on national governing body standards and taught by qualified instructors, leading to formal qualifications as well as Scout badges. As you may be aware, we are due to undertake some significant building works at The Den, hopefully starting in the next few months. This is likely to impact on our ability to run boating courses at The Den, and as such we have had to cut down on the number of courses we are able to run this year. We will be running a small number of combined RYA Stage 1/2 sailing courses to give new members of 3rdCB some basic boat training, building their confidence to join in with open boating sessions. Details of how to book onto these courses are below. 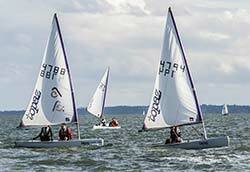 Please note there is a small charge for the course of £15 to cover RYA logbooks and certificates. For those who were hoping to complete a higher level of sailing course, please continue to attend the general boating sessions and bring your logbooks down with you. Where possible we will run some more structured general boating sessions, with the aim of getting elements in your logbooks signed off and conducting direct assessments for courses, for those that feel ready. We accept that the limited course programme this year may cause some disappointment, but feel we need more flexibility around the programme to maximise the amount of people we can get afloat this year, whilst working around the building works. We appreciate your understanding in this. Stage 1 & 2 – A basic understanding of how a boat sailing, with some experience of steering and handling the boat.By the end of the course you will have a range of sailing skills and knowledge to help in becoming a confident sailor. There is a lot of demand for these courses, so we only allow you to complete one sailing course per year to help everyone get a go. You will also need to show evidence of practice (eg general boating sessions at The Den or your own yacht club, recorded in your logbook) before we will allow you to progress onto a more advanced level course. If all the courses fill up there is a waiting list system on the booking page and we will endeavour to schedule some more courses later in the year. For all activities afloat you will need to bring suitably warm clothing and footwear, which you don’t mind getting wet. Jeans and wellies are not appropriate. The Den has a selection of waterproofs, wetsuits and buoyancy aids available for your use. You will need swimwear to put on under a wetsuit, and a towel to dry off with. If it’s sunny make sure you wear sun cream and a hat. You may also want to bring a packed lunch and drink or money for chips. Water activities, as with all outdoor activities, are weather dependant and subject to leader availability. If we do have to cancel a session it will be published on the Group Facebook page – please check this before travelling down to the Den, especially if the weather is bad. Learn a basic understanding of how a boat sailing, with some experience of steering and handling the boat. By the end of the course you will have learnt a range of sailing skills and knowledge to help in becoming a confident sailor. Duration: 2 Days. Attendance on both days is required to complete the course. Cost: £15. This is to cover the RYA youth sailing logbook, certificate and safety boat fuel. (This is much less than cost price). The instructors are volunteers and are not paid. Booking: Click the Tickets link above or see 3rdCB.org.uk/courses for more details and to book a place on this course. Full details on timings and what to bring will be sent before the course. Contact boating@3rdCB.org.uk if you have any further questions. Open boating session for any member of the Group to go on the water rowing, sailing or swimming. Sessions are always supervised by a suitable leader, and no experience is necessary.There is no charge for participating in general boating, just ensure you are down in time good time for the briefing. You will need to bring suitably warm clothing and footwear, which you don’t mind getting wet. Old trainers are fine, jeans and wellies are not appropriate. The Den has a selection of waterproofs, wetsuits and buoyancy aids available for your use. You will need swimwear to put on under a wetsuit, and a towel to dry off with. If it’s sunny make sure you wear sun cream and a hat. You may also want to bring a packed lunch and drink or money for chips.Boating activities, as with all outdoor activities, are weather dependant and subject to leader availability. If we do have to cancel a session it will be published on the Group Facebook page – please check this before travelling down to the Den, especially if the weather is bad. Sessions are always supervised by a suitable leader, and no experience is necessary. There is no charge for participating in general boating, just ensure you are down in time good time for the briefing. You will need to bring suitably warm clothing and footwear, which you don’t mind getting wet. Old trainers are fine, jeans and wellies are not appropriate. The Den has a selection of waterproofs, wetsuits and buoyancy aids available for your use. You will need swimwear to put on under a wetsuit, and a towel to dry off with. If it’s sunny make sure you wear sun cream and a hat. You may also want to bring a packed lunch and drink or money for chips. Boating activities, as with all outdoor activities, are weather dependant and subject to leader availability. If we do have to cancel a session it will be published on the Group Facebook page – please check this before travelling down to the Den, especially if the weather is bad.